The precise erosional forms which the karst takes depends on many variables. The mechanical structure and chemical composition of the rock, the local climate and temperature range, and the amount of vegetation and rainfall a region has all determine how fast a carbonate landscape erodes. Karst along a seaside is quite different than that inland, and tropical karst does not resemble karst in temperate or sub-Arctic zones. Landforms in zones with earthquake activity are quite different than that in quiet zones, or places where mountain-building have turned the layers of carbonate rock on edge. 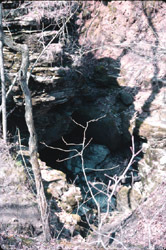 Some karst is formed as a result of sulfuric acid welling up from below instead of carbonic acid percolating down from above. Some places in the American West are a mix of the two processes. A spring is a natural resurgence of groundwater, usually along a hillside or from a valley floor. A cave is an airfilled underground void, large enough to be examined in some way by man. A sinkhole or sink is a collapsed portion of bedrock above a void. 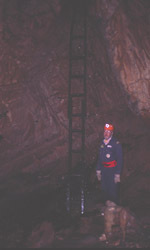 Sinks may be a sheer vertical opening into a cave, or a shallow depression of many acres. A losing stream is one with a bed with allows water to flow directly into the groundwater system. There are many chert bottomed losing streams in the Ozarks. A natural bridge or tunnel is a void beneath still standing bedrock, usually of short extent, and allowing human passage from one end to the other, at least part of the time. A natural bridge is somewhat shorter than a tunnel, and is more inclined to be air filled than partly water filled. Missouri, especially south of the Missouri River, has all the natural resources to make, (in the words of Jerry Vineyard, one of our best known geologists and cavers) a wonderful cave factory. Karst is formed when rainwater picks up carbon dioxide from the air, and dead plant debris in the soil, then percolates through cracks dissolving the rock. The bedrock becomes saturated with water at some level, and dissolving continues as the water moves sideways along bedding planes (horizontal cracks between rock layers) and joints (or fractures) in the rock itself. These conduits enlarge over time, and move the water, via a combination of gravity and hydraulic pressure, further enlarging the conduits through a combination of solution and abrasion of water on the surrounding rock. Eventually, much of this water under pressure reaches the surface of the land as a spring. A spring may emerge high on a cliff, at the base of one, or even forced upward from below the level of the surrounding surface streams, depending on nature of the surrounding rock, and the altitude of the groundwater level, with respect to the base level of the controlling stream in a drainage area. 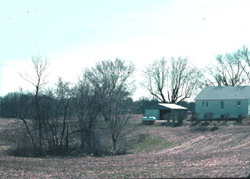 Often in Missouri, springs have little relationship to surface drainage, because so much of our water movement is actually groundwater movement. 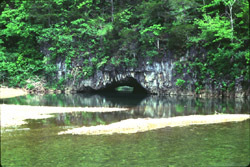 In some areas of the Ozarks, more than 70% of all water goes underground via karst processes. As groundwater levels in an area drop, more and more of the underground passage becomes air filled. When it is sufficiently air filled, springs become cave entrances, passable by humans. Other voids never develop a natural opening, and are intersected by drilling, notably of wells looking for water. At this point, due to changes in chemical equilibrium underground, the resulting caves begin to fill with dissolved mineral, called cave deposits or speleothems. Caves may refill with water or continue to dry out, or even cycle several times as water levels change. Erosion continues underground, and eventually a cave hollows enough for the roof to thin, and the cave collapses. Such cave collapse may actually unroof the cave if it is near enough to the surface, or simply form a slump in the level of the land. In either example, a sink forms. 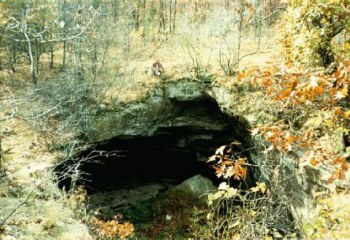 Natural bridges and tunnels can be formed as resistant remnants of a cave collapse, or independently, if a block of bedrock becomes cut off from the main land mass, and it is hollowed out by wind, ice wedging, and rain. Many karst areas have poor soil, and do not retain water easily, allowing it to go directly underground. Sinks also act as "swallow holes" for rainwater; some sinks take water under certain conditions, and resurge it at others. These reversible sinks, called estavelles, are among the curiosities of karst. 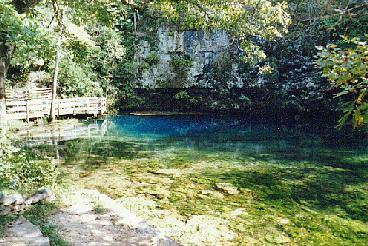 Some springs in the Ozarks are periodic, or "ebb and flow" springs, whose discharge can be measured to rise and fall independent of local rainfall. Many theories, but no one knows why, for sure. Another oddity of Missouri karst is the karst window, where one may look into a cave or water filled sink below, but getting down there is another matter entirely. Karst makes for beautiful scenery, but it is very vulnerable to groundwater pollution, due to ease of water flow. Natural filtration is nearly non-existent in karst. To make matters worse, the use of cave conduits as natural sewer lines, and sinkholes as garbage dumps in small towns and rural areas puts the local drinking water supplies at risk. It is only recently that these problems are being addressed. Urban expansion in karst areas often means the building of houses on land which cannot support them and problems with septic tanks, underground pipeline breaks and landfills. Some of the most beautiful sites in Missouri are a result of karst processes, as are some of our most pressing land use problems. Public education about our karst jewels and our karst nightmares is the best way to preserve what we have, and to fix what needs fixing. For places to view Karst in Missouri see Places to Go, Things to See.